UCSF HEARTS is an awarding-winning program that aims to promote school success for trauma-impacted children and youth by creating more trauma-informed, safe, supportive, engaging, and equitable learning and teaching environments that foster resilience and wellness for everyone in the school community, students and adults alike. Equity and social justice through cultural humility and responsiveness are central to our approach. 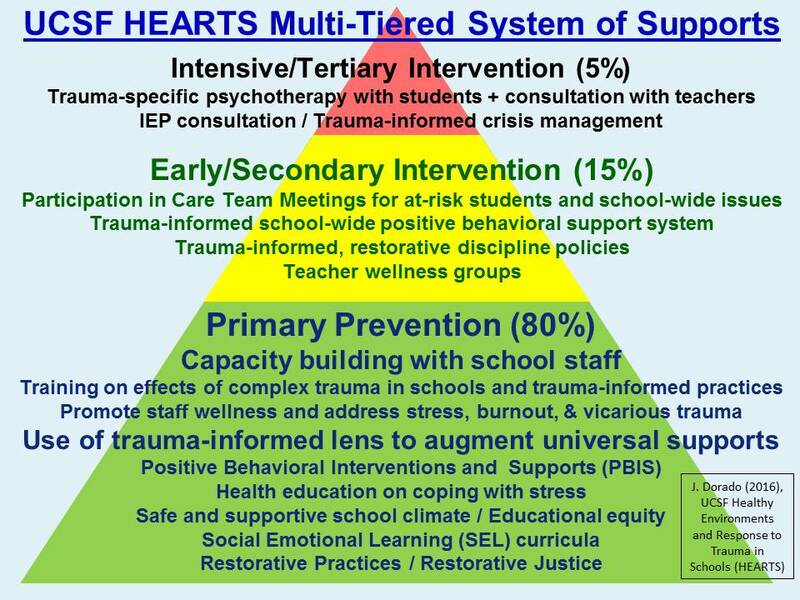 HEARTS is a whole-school, prevention and intervention approach that utilizes a multi-tiered system of supports (MTSS) framework to address trauma and chronic stress at the student level, staff level, and school organizational level. The MTSS triangle below lists some some of the supports provided by UCSF HEARTS across the three tiers when the full, site-based program is implemented. Interrupting the school to prison pipeline through the reduction of racial disparities in disciplinary office referrals, suspensions, and expulsions. HEARTS is largely aimed at school climate and culture change through building capacity of school personnel around implementing trauma-informed practices, procedures, and policies. Thus, supports and services are planned and implemented in close collaboration with school leadership and with a regularly-meeting team of key school staff (e.g., coordinated care teams), along with the rest of the school community (e.g., administrators, credentialed and classified staff, students and their caregivers). Systems change typically requires 2 to 5 years, depending upon the degree of a school site's level of need, and the intensity of HEARTS services provided. The full, site-based program includes a HEARTS consultant on-site at a school 3-5 days per week, collaborating with school leadership and staff around providing the full range of supports and services across all three MTSS tiers. Services include training and consultation to school site and district staff and onsite psychotherapy for trauma-impacted students. HEARTS implementation can also focus on primary prevention (tier 1) and early/secondary (tier 2) intervention, without direct therapeutic services for students. These supports involve a HEARTS consultant/trainer who provides capacity-building consultation and training to school site staff or district central office staff ranging from once monthly to twice weekly. Frequency of training and consultation depends upon needs and resources of a school site or district.